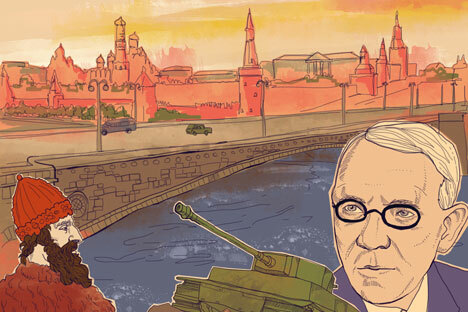 Alexander Terekhov’s “The Stone Bridge” (Glagoslav Publications) is a whirling novel that collides present times with the grim epoch of Stalin purges. Based on a true story, the novel reconstructs the Stalinist Russia in perfect detail, using real documents and photos – but “The Stone Bridge” is written in vivid, pulsing language that makes it much more than a historical detective. “The Stone Bridge” will be presented by the author in the Read Russia program at the London Book Fair, April 8-10. The Great Stone Bridge is recognized as the best location from which to view the Kremlin and study Russian life. The bridge has had the best view since the time of Cornelis de Bruijn, a Dutchman and painter, three hundred years ago; in more recent days, images of and from the bridge figured in the title sequences of the Vremya TV news broadcasts which replaced, for the Soviet people, the evening church service. The Great Stone Bridge was the first stone bridge in the city — and happened to be the last. When it was built, it was considered to be the fourth wonder of Russia after the Tsar’s Bell, the Tsar’s Cannon and Ivan the Great’s Bell Tower. Ivan the Third cleared Borovitsky Square, moving wooden houses away from the Kremlin thereby nullifying the fires that tended to burn them, and making Tatar sieges difficult. Moscow life, forced thusly outward from the verboten square, crossed the river and moved south, into the Strelets villages, along the road from Veliky Novgorod to Ryazan. Since these new arrangements required that supplies be transported across the river, Tsar Mikhail Fyodorovich summoned the craftsman Jagan Christler from Strasbourg, along with his uncle and his tools, which had names like magic spells: mattocks, bills, cantdogs, parbuckles, trowels, salters. But just as the enormous cubes of white stone for the would-be bridge began to arrive in Moscow from Nastasin, everyone involved in the project unceremoniously died — both Germans and the Tsar. The seventeenth century bore a striking resemblance to the twentieth. It began with troubles, and ended with troubles: civil war, an uprising of peasants and Cossacks, campaigns to the Crimea, Boyars “chopped to bits” by rebels, doctors who confessed under torture to poisoning Tsars, and Old Believers burnt at the stake during the the stone bridge month known to us now as Bloody April. It was a time when Russians suddenly and obsessively turned to their past, considered their own present, and then decided rather frantically to begin rewriting the books on every historical sore spot: the schism in the Church, the streltsy rebellions, the place of our land on the globe which had just been imported to Russia. Children and women argued about politics in the streets! Suddenly the common people realized: we also exist, we take part, we are witnesses. And how sweet it was to say I. In the year when Boris Sheremetiev went to the Hapsburg court of Emperor Leopold and Prince Golitsyn led the charge to Perekop, returning from the Konka River with nothing because the Tatars had set fire to the steppe, a monk who was able to read the drafts left by the late German bridge builder finally completed the new wonder of the world — the Great Stone Bridge. The bridge had eight spans, and was made of white stone. It was four hundred and sixty feet — seventy sazhens — long. Sideshows brought wax figures, savages from Africa, and a siren fish recently caught by fishermen. Crowds at the shows gnawed on sunflower seeds and bought colorful balloons inflated with gas. Convicts knelt in the dust, with signs — Arsonist, Robber — around their necks. Constables with theatrical halberds, hirsute students smoking casually and short-haired girls in dark glasses, the Wolf Pack tavern in a dirty two-story building, the jetty of the Moscow Fishermen’s Society (nothing more than a hut on a wooden raft with a bunch of boats tied to it) — and everyone seemingly with a sense that this life on and around the bridge couldn’t last (especially when in the flood of 1783 three arches collapsed at once, crushing a fisherman and some washerwomen). Still, when Alexander the Second took the throne and had the great old bridge dismantled — the old masonry wouldn’t yield to hammers and crowbars, it had to be blown up — people would not forgive him this deed and remembered it often and bitterly. The best minds of Russian architecture (which had become Soviet architecture without evident effort) competed to build the Third Bridge: Peredery, Zholtosky, Shchuko, Shchusev. Vladimir Shchuko won with his powerful one-span steel arch. The losers had preferred the narrowness and multiple arches of Moscow’s antiquity. Shchuko was the only one to experience a genuine epiphany, to look out his window in the pre-dawn mist and see there: MOSCOW SEA PORT. Canals! Moscow — Volga and the White Sea! Caravans of ships under the bridge! Swiftness, force and resilience, and all of it expressed in that single, surpassing insight, that one individual arch. On 5 March 1938, the bridge was tested: one hundred and forty ten-ton trucks and twenty fully-loaded trams rolled over it. Meanwhile, four Bolshevik polar explorers drifted over the North Pole on an ice floe, Japan was fighting in China, girls on advertising posters advised the public to drink coffee with liqueur manufactured by the vodka and liqueur department of the People’s Committee for Food Manufacturing, and engineers were testing a new invention — a telephone answering machine. But these and many other first fruits of the general plan for the reconstruction of Moscow — metro stations, parks, streets, bridges — felt remote and overshadowed in the spring of 1938. Completion of construction projects coincided with the surfacing of right-wing Trotskyist vipers from the swampy depths. Technological advances were lost amid news of the so-called Trial of the Twenty-One with Bukharin among the convicted. The trial was concluded with the customary Russian executions of “beasts in human guise,” the customary Russian accusations against rivals and a completely non- Russian submissiveness on the part of the victims. A pedestrian on the Third Bridge would very soon have stopped admiring the eternal Kremlin: the foundation had already been laid for the Palace of Soviets, and the pace of construction was such that you’d think something in Russia was about to end forever. In just ten months the frame of the Palace was supposed to rise as high as the Second Building of the Council of People’s Commissars, and grow higher, to 320 meters at which point it would be topped with a statue of Vladimir Lenin (the index finger of which was itself five meters long). The sum of these two figures (320+100) was supposed to give a clear indication to the Statue of Liberty (33 m), and also the Cheops Pyramid, the Cathedrals of Cologne and Amiens, the Eiffel Tower, and finally the Empire State Building in New York, of exactly who was going to save world. Great ideas demanded stone edifices of a great size. A shadow, though, a black shadow, was creeping, growing and thickening over Moscow, obscuring everything. It swallowed these weeks of executions (two thousand people were shot every day), and blotted out concerts, and the premieres of two films: Volochaevsky Days and The Youth of the Marshall (a biopic of young Semyon Budyonny, the cavalryman with the most famous whiskers in the Soviet Union). In its utter blackness, seething and shuddering, it conflated all events, as if saying: the only thing you’ll ever see from the Great Stone Bridge is Russia, and nothing else; saying: now you may build only tanks and planes; saying: you can’t kill that many of your own people anymore because there are already others coming to kill us. The steel of the Palace’s frame had to be recast into anti-tank hedgehogs and railroad bridges when the Donbass was overrun by the German army and new rail construction was begun in the Russian North, where there was coal. In the end, nothing could be annulled.